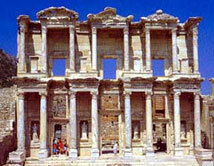 Ephesus is one of the best-preserved ancient cities in the world with a history dating back the 12 C BC. It was an important trade and religious center. During the Roman period its population reached approx. 250,000. One of the seven wonders of the world, Temple of Artemis was in Ephesus. It is also the site of one of the Seven Churches of Revelation. St. Paul lived and preached for about 2 years in Ephesus. Today it is estimated that between 15-20% of the city has been excavated. Some of the highlights are the Odeon, Celsus Library, Great Theater, Commercial Agora, Terrace Houses, Blue Marble Street, Scholistica baths and Brothel.